After only one hour from the start of Ostrava Golden Spike two World Records have been rewritten. In the pole vault Emmanouil Karalis jumped 5.55m, his new PB and new U18 Word Record; former best measure was 5.51m, held by German Chiaraviglio since 2004. The young Greek improved his 5.54m, actual indoor world record. 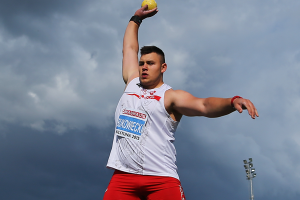 In shot put instead, Polish big guy Konrad Bukowiecki, improved his PB with the 7,26kg put with 21.01m, U20 World Record.